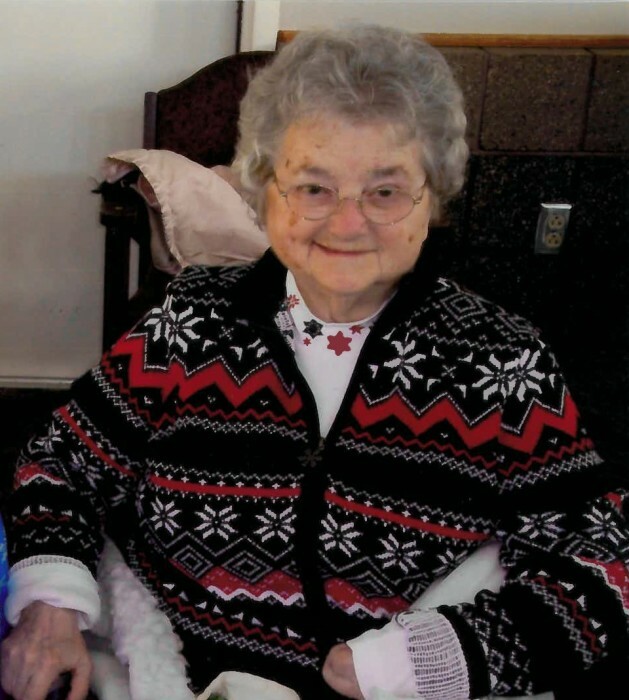 Olive Polzin, age 95, a resident of Evergreen Terrace in Grand Rapids passed away peacefully on February 5, 2019 in Grand Itasca Hospital in Grand Rapids. Olive was born November 22, 1923 in Bovey, MN as the oldest daughter of George and Alvilda (Jacobson) Dippold. She was a rural resident of Bovey for most of her life and attended the Greenway schools where she graduated in 1941. Olive married Edward Polzin on September 26, 1941 at Mt. Olive Lutheran Church in Bovey, MN where she stayed a member the rest of her life. Olive and Ed Raised three lovely daughters who along with the grandchildren were the joys of their lives. Olive loved her church where she was a member of the Church Circle, taught Sunday School and released time classes, and worked in the kitchen for many events. She worked in the Danube Mine during World War II to support the war effort. She enjoyed being a member of the County Home Extension for Trout Lake. Olive was adept at sewing and was an excellent baker. She enjoyed preparing large, tasty meals for the family. A favorite hobby was working in her many flower gardens. Olive was preceded in death by her husband Ed of almost 65 years, her parents George and Alvilda, and sister Violet Fremont. She is survived by her children; Sandy (Wayne) Thorson of Bemidji, Jayne (Bob) Lindgren of Estero, FL and Palisade, MN, and Trudy (Harry) Huffer of rural Bovey. Olive is also survived by a sister Delores (Ron) Voigt of Cotton, MN, seven grandchildren, 19 great grandchildren, one great, great grandson, and many nephews and nieces. The funeral service will be held at 11:00 AM, Saturday, February 9, 2019 at Mt. Olive Lutheran Church in Bovey. Visitation will precede the service at 10:00. The Reverend William Zeige will officiate. Interment will be at Lakeview Cemetery in Coleraine, MN. Arrangements have been made by the Peterson Funeral Chapel of Coleraine.